Harvey C: My name is Harvey and I'm 10 years old. I like Spider-Man comics and my favourite Marvel character is Thanos. I chose to read Secret Wars because I already like all the superhero teams and here they come together and I thought it would be awesome so that's why I wanted to read it. In Secret Wars superheroes and villains are taken to somewhere call Battleworld by someone called the Beyonder. The Beyonder wanted to see who was the strongest but the heroes and villains wanted to get back to Earth, they didn't want to do the challenge. Doctor Doom had his own plans. Spider-Man is my favourite character in Secret Wars because he's really fast in battles and also defeated a really strong super-villain called Titania. This was also the series where he first got his black suit which later turned into Venom. I liked the art a lot, especially when it showed all the different places in Battleworld, and the double-page spread in issue #1 which had all the heroes looking surprised on the spaceship was awesome. The best cover was for issue #9 as it has all the Avengers, X-Men and Fantastic Four flying and running and jumping to fight Galactus. I liked it because I could finally see all the heroes fighting one of the most powerful beings in the universe. I've not read much about Galactus before but in Secret Wars he's amazing. One of the best scenes is in issue #12 when the Avengers and everyone else battle monsters made by Klaw's sound powers. 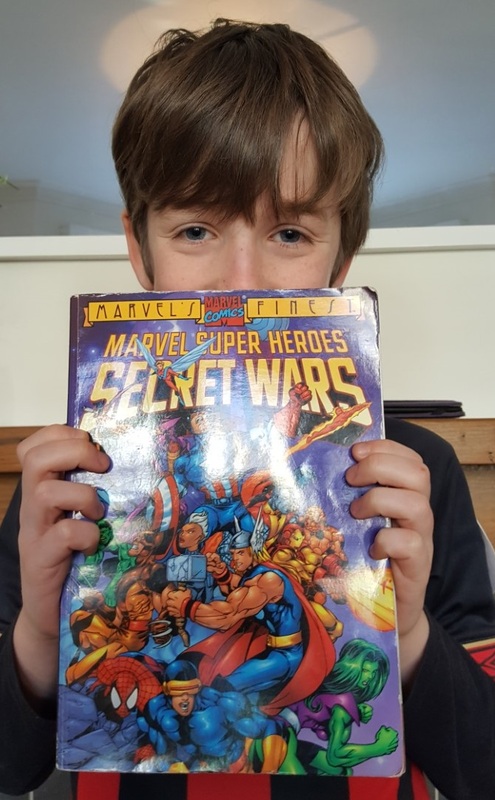 I think I would give Secret Wars 10/10! Never read this but now I will.